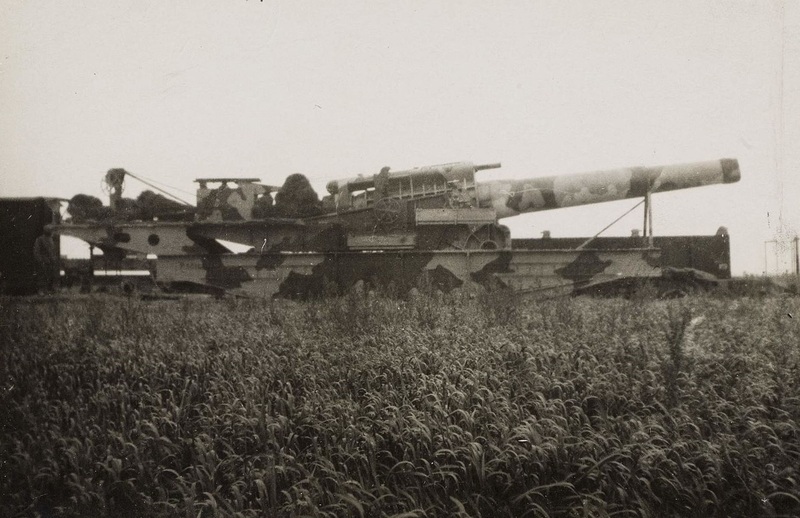 The Obusier de 400 Modèle 1915/1916 was a French howitzer, which was converted during the first world war to the largest railway gun of the French army and was used both in the first and still in the second world war. 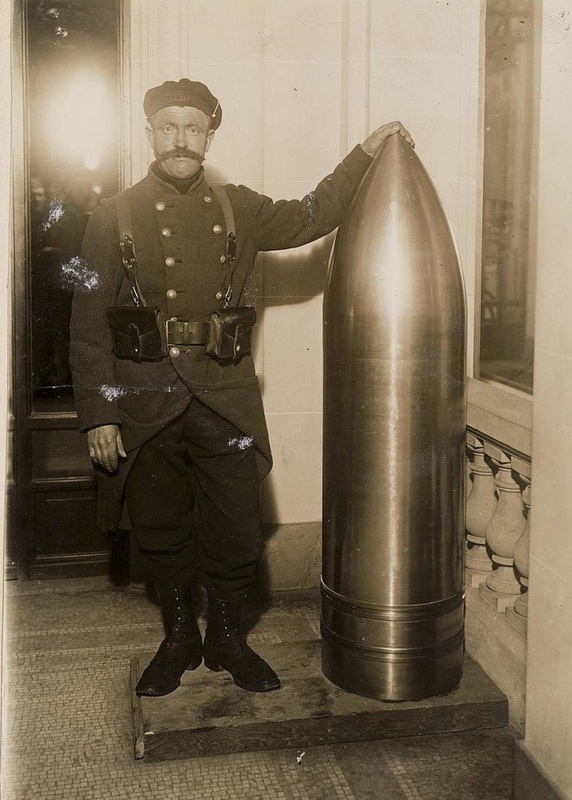 Because of the successes and the great penetrating power of the German guns in firing at the fortresses of Liège, Namur, Antwerp and Maubeuge, the French High Command also demanded heavy guns. These should be able to damage or destroy the increasingly fortified German positions, the light field guns already in use would not be sufficient for this task. 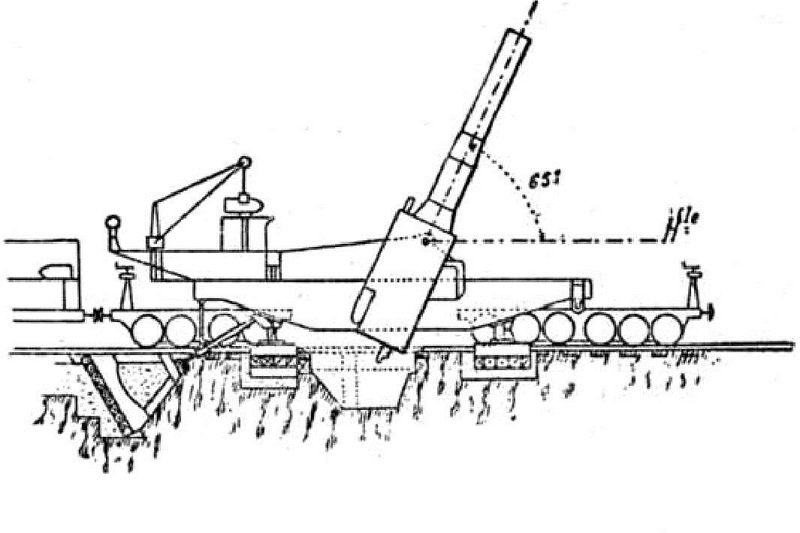 Some heavy coastal guns or decommissioned naval guns had already been converted to railway guns and used, as their penetration power was considered too low to destroy the German concrete plants and bunkers. Therefore even bigger guns with an even bigger caliber were demanded. 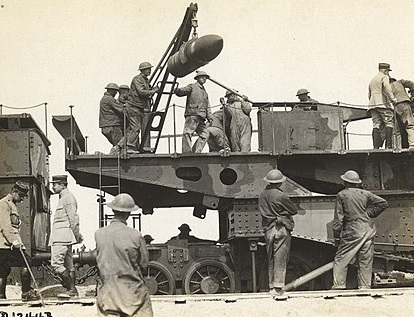 The St. Chamond company then began converting 400 mm naval guns into railway guns in mid-1915. For this purpose two railway wagons were connected with a steel frame. 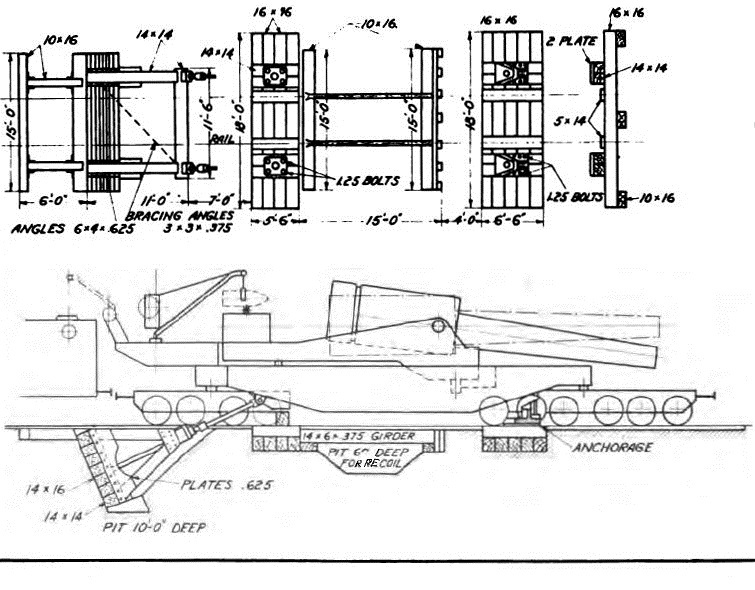 Since the centre of gravity of the guns was very top-heavy, the rear wagon had only 4 axles, the front one 6 axles. In order to be able to drive the construction around tighter curves, rotating platforms were mounted on the front as well as on the rear wagon, so that the entire construction could be aligned more flexibly. The guns used were naval guns which had already been taken out of service, from which warships they were taken is not known. They had a Welin breech and used separate cargoes and projectiles. For loading the pipe had to be lowered so that a loading platform could be raised at the rear part of the gun. A hydropneumatic recoil system was used to absorb the recoil. This allowed the gun to slide back a few metres after a shot, and then slide forward again to its original position. 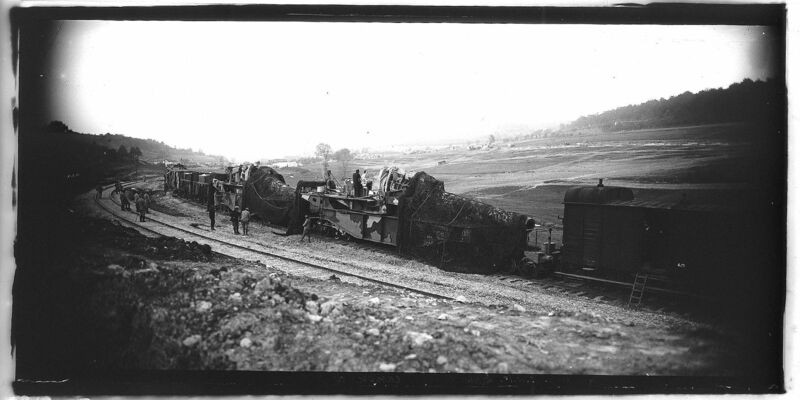 In order to bring the railway gun into the firing position, the tracks had to be moved to the appropriate position. Then a deep hole had to be dug under the tracks so that the gun could retract when shooting at a high angle. 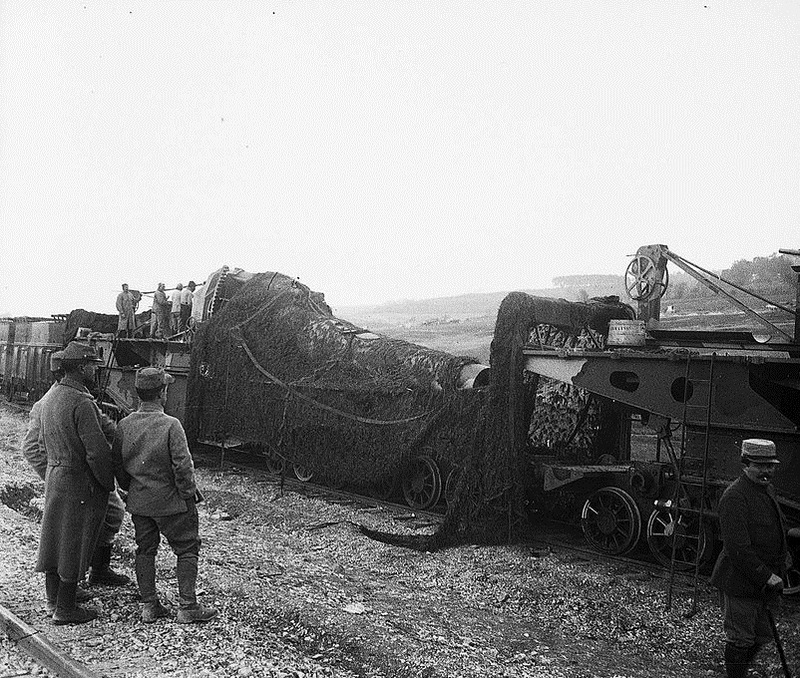 From the end of October 1915 the first of the altogether 8 Obusier de 400 Modèle 1915/1916 could be delivered in the variant 1915. 1916 followed after some modifications 4 further railway guns in the variant 1916, so that altogether 12 of the guns were built. 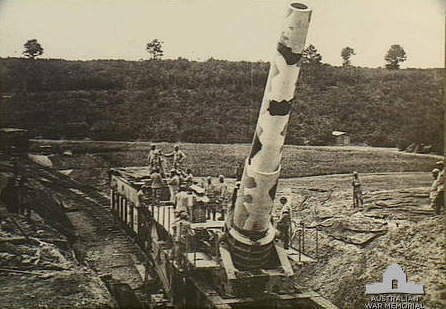 With its 400 mm caliber the Obusier de 400 Modèle 1915/1916 belonged to the largest railway gun of the whole war used by the French army. The first use of the war was made by the guns from 30 June 1916 during the Battle of the Somme. There they served as support for the upcoming offensive and fired at the German fortifications of the villages Herbécourt, Estrées and Belloy-en-Santerre, which were then only ruins. 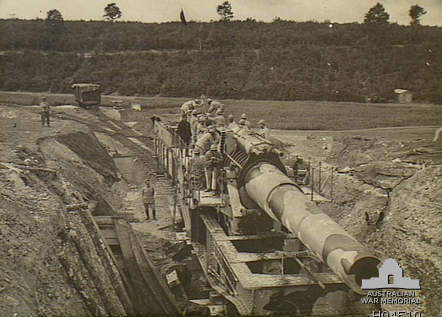 The second use of the railway gun was during the reconquest of the fortresses near Verdun. For this purpose, the two guns of the 3rd Foot Artillery Regiment were set up 13 kilometres southwest of Baleycourt in order to be able to support the starting offensive on 21 October 1916. 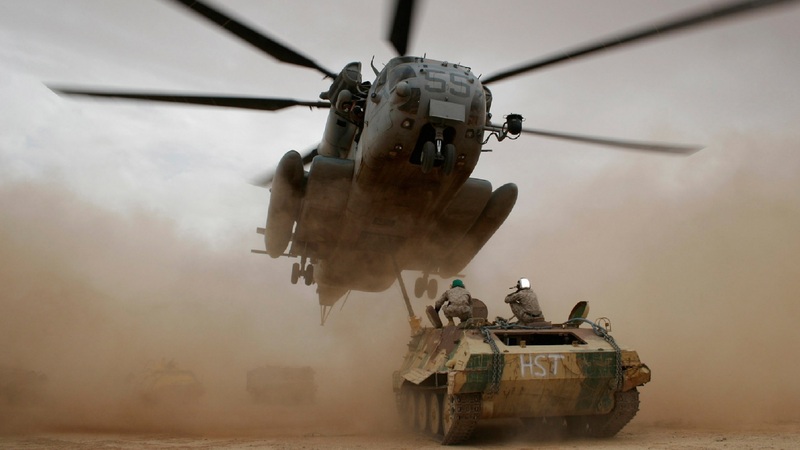 In the next 2 days about 373 of the deployed 370 and 400 mm guns alone were delivered. Especially the occupied forts Douaumont and Vaux were bombed. At the Fort Vaux alone on 23 October 1916 about 50 shells struck and destroyed the infirmary, several corridors, casemates and finally an ammunition depot, after whose fire the German soldiers had to give up the fort. 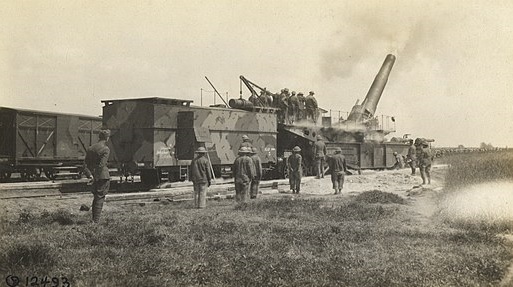 The last major deployment of the railway guns took place in April 1917 during the support of the offensive at Reims. There the German troops had strongly developed fortifications at Brimont, Witry-lès-Reims and Berru as well as bunkers and tunnels under Mount Cornillet and Mont-sans-nom. Through aerial reconnaissance and interrogations of captured German soldiers, the French High Command had an overview of the entrances and ventilation shafts of the German bunkers. In the middle of May 1917 the bombardment of the bunkers was started. First the entrances were bombed to block the escape of the soldiers. Then the ventilation shafts were bombed, so that the enclosed soldiers suffocated. A grenade was able to penetrate the 30 metre thick limestone layer above one of the bunkers and exploded inside the German bunker. Around 400 soldiers lost their lives. 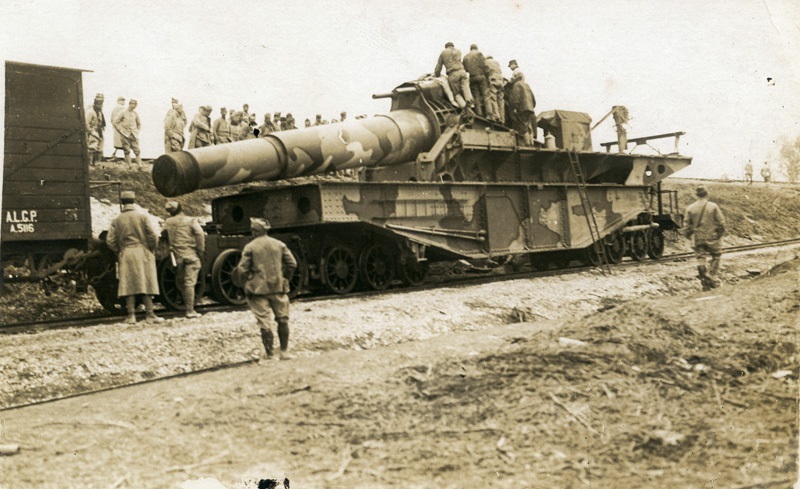 In addition to the French army, the 52nd artillery regiment of the Coast Artillery Corps of the American troops received 2 of the railway guns. On the basis of these guns, the USA built the railway howitzer M1918. Even after the First World War, the French railway guns served as the basis for other American railway guns and coastal artillery. After the First World War, the remaining 10 French railway guns remained in depots as a reserve. When the Second World War broke out, 8 of the guns were used to reinforce the Maginot Line in Alsace and Lorraine. After the capitulation of France in 1940, the German Wehrmacht captured the guns and put them into service under the designation 40 cm howitzer (E) 752 (f). These were brought to the Eastern front at the beginning of the war against the Soviet Union and 6 of the guns were used for the siege of Leningrad, the other 2 guns were used for spare parts.